Ships Monday, April 22 if ordered in the next 2 days, 15 hours and 18 minutes! 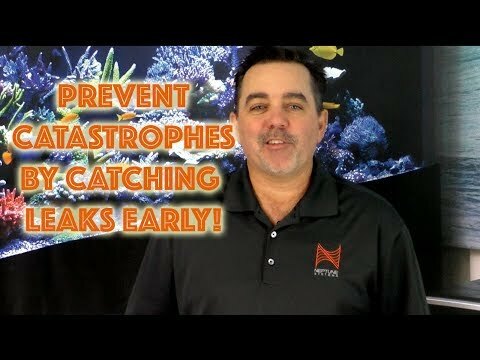 Detecting a leak early can be the difference between saving a tank to an entire loss. Neptune's Leak Detection Kit is the perfect solution for anyone that uses an Apex Controller to monitor and control their aquarium. The LDK system will plug right into your current Apex through the Aquabus connections and includes two Leak Detection Sensors. The sensors can be placed in multiple areas around your tank and its equipment. Pairing an Apex Controller with the LDK lets you monitor and control your aquarium in the event of a leak or an overflow. With Neptune Fusion, you can easily set up alarms that will notify you if a sensor ever detects moisture, and also control any equipment that is powered by an EnergyBar. One common example of common programming and placement is to place a leak detection probe on top of your protein skimmers lid, and if it ever overflows the sensor can notify your Apex of the issue, and shut down the protein skimmer keeping all the skimmate from flowing back into your aquarium. Note: Updating your Apex Controller to the latest AOS is required.